The first company formed in the Southampton Fire Department was the Agawam Engine Company. The original members were a group of men who started the Department. During these first few years the meetings were conducted by J.H. Pierson who organized committees to purchase needed fire equipment such as buckets, hats, ladders and apparatus. Monthly meetings were held on the first Thursday of each month as they still are for firematic and social purposes. Throughout all the ensuring years, members and old timers alike have especially enjoyed the social activities, cards, pool, and friendly conversation. Upon organizing, officers were elected and by-laws written. The first elected Foreman was Oscar L. Howell and his Assistant Foreman was W.D. Van Brunt. W.O. Williamsen was elected the first recording secretary and was privileged to hold this post for forty-six consecutive years. At the outset it was decided to construct a building to meet in and house the equipment. A proper building was erected on donated land and a 415 lb bell was purchased to gather the members together whenever there was a report of a fire. After several years, the Bucket Brigade was replaced by the donation of a new Ramsey 8 ½’ cylinder hand pumper and a hose cart, given by Mr. Barney and Mr. Trevor of our summer colony. Each member has his own task to perform with this modern equipment and thus became very proficient when called upon at fires. It was during these early years that the company entered into many tournaments throughout Long Island and New York City hauling their apparatus by railroad flatcar. It is quite evident by the display of trophies in the showcase at Windmill Lane Firehouse that the Agawam Engine Company met every challenge. In 1912, the company resolved to form a new hose company and the charter members of the Agawam Hose Company were all active members of the Agawam Engine Company #1. In December 1916 the company purchased its first mechanical apparatus. Hunting Jessup was appointed head driver and engineer of this new Ford. This equipment performed solely for all pumping until the purchase of a Ford chemical truck in 1927. The following year the company was fortunate to have another truck, this being a Packard, donated by Samuel Parrish. As the fire district grew in size so did the company’s equipment by expanding to four trucks, a LaFrance, a Reo, a Packard and a Ford. Evening drills became a regular event as the members strived to maintain an efficient level of fire protection. In the early 1940’s two new Mack pumpers were purchased, each having a pump capacity of 500 gallons per minute along with an ample supply of water storage, hose and up to date hand tools. For years these trucks were the main pumpers for the Fire Department and served to supply both hose companies and hook and ladder with sufficient amounts of water for all purposes. Prior to the introduction of two way radio communication, one enterprising company captain introduced a complicated set of hand signals to be used between the pumper at the source of water and at the scene of the fire. Although this provided a source of entertainment within the company, it did serve an efficient and practical method of communication for some time. During the 1950’s another major step was taken by acquiring a Dodge four-wheel drive Power Wagon and two surplus four-wheel drive vehicles, which were designed for both woods and brush fires. These trucks were often as attack on structural fires because of their mobility and capacity in delivering a quantity of water at the fire quickly. Due to the growth of the fire district in the 1960’s, the Engine Company was actively trying to update equipment to insure proper fire protection as well as also qualify for maximum insurance ratings. It was in the 1960’s and the 1970’s that a twenty year replacement program for apparatus became Village Board policy and Engine Company acquired the following trucks: (1) International four-wheel drive pumper complete with a Barton American front pump, booster reels, 800 feet of 3” hose and 450 feet of 1 ½ “ hose, (2) G.M.C pumper with Barton American 750 gallon per minute pump, booster reels, 700 feet of 3” hose and 750 feet of 1 ½ “ hose, (3) F.W.D. 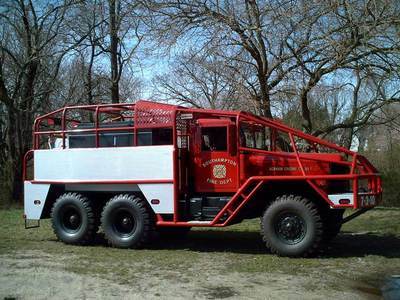 cab over engine pumper with a Hale 1000 gallon per minute pump complete with sufficient hose and other essential fire equipment, (4) two International four-wheel drive brush trucks complete with automatic transmission, Hale pumps, booster reels, and ample tools. Today, the 35 members of the Agawam Engine Company respond to the emergencies that they are called to resolve in two Pierce pumpers with 1500 gallon per minute pumps, complete with sufficient hose and all other essential fire equipment. 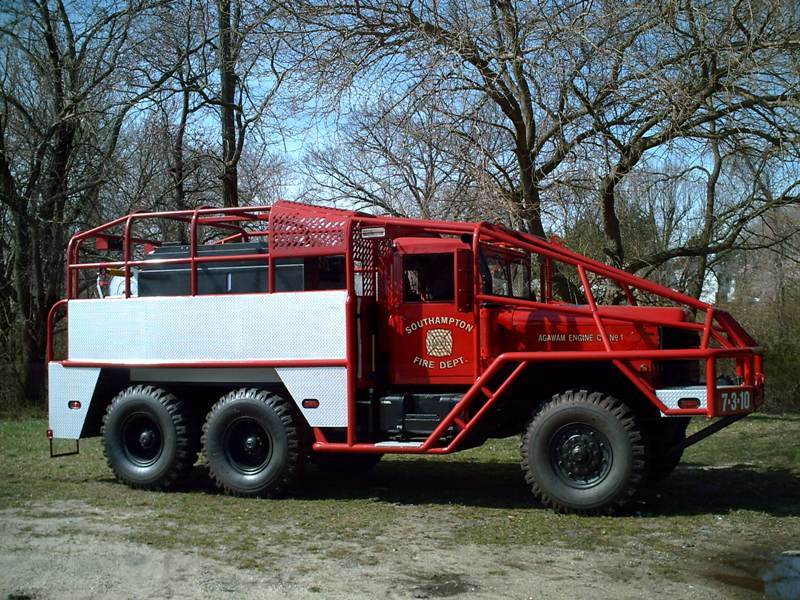 They also respond to woods and brush fires with one 1975 International four-wheel drive brush truck. The newest addition to the Engine Company was in 2006, the company received a 5 ton multi purpose vehicle, which is equipped with 1000 gallons of water, 30 gallons of foam, booster reel, two 200 foot 1 ¾ “ hand lines, GPS and all the essential fire equipment. Now the Engine Company can quickly and efficiently handle emergencies in our flood areas, beachfront properties and will be able to respond in the worst of our winter conditions. Throughout these many years since 1881, the Engine Company has always performed as a close unit, striving for excellence. Past and present members have many interesting and exciting stories to tell of that unusual fire of yesterday. The camaraderie, friendship, trust and support between members make each of us proud to have been or be in the Agawam Engine Company #1."